I’ve written for the Guardian today about the experience of watching “Power of the Daleks” as a massive, massive Doctor Who nerd who knew nothing about the story and was able to watch the new animation as if it was a brand new story. Having watched it, I was able to go back and look at the telesnaps of the original, which I’d always avoided because *SPOILERS SWEETIE* to see how what was left of the original show actually looked. 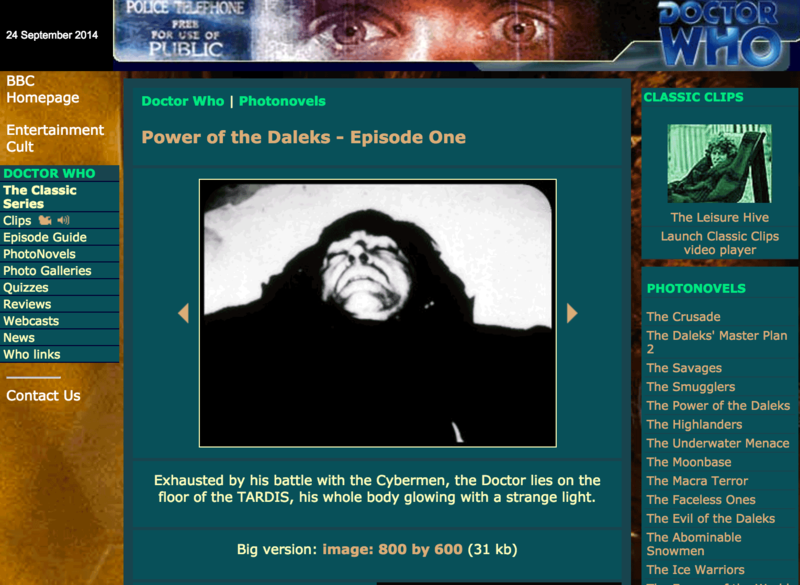 The photonovels were lovingly put together by the BBC Cult team, and act a bit like an internet TARDIS themselves. 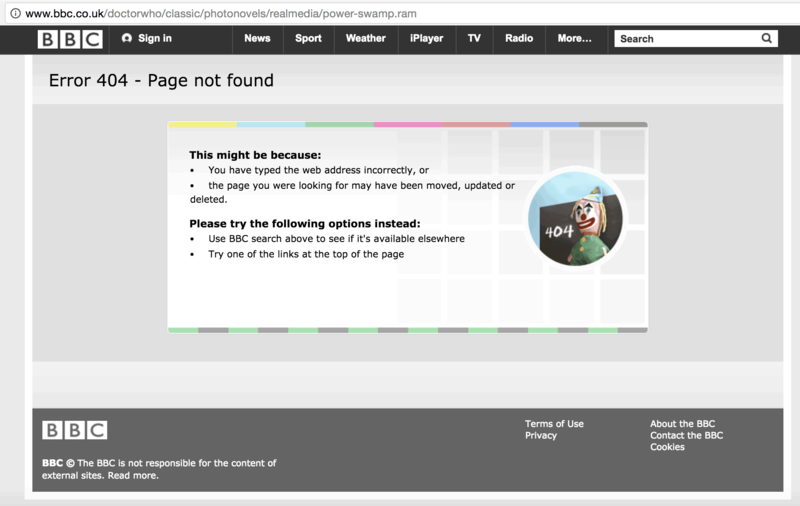 Having carefully digitally scanned the surviving pictures of the missing episodes, even the “large” versions are only at 800 by 600 and compressed down to 30kb or 40kb, because the BBC was absolutely paranoid at the time at supporting anybody using any device with a tiny screen that only has access to the smallest of bandwidths. 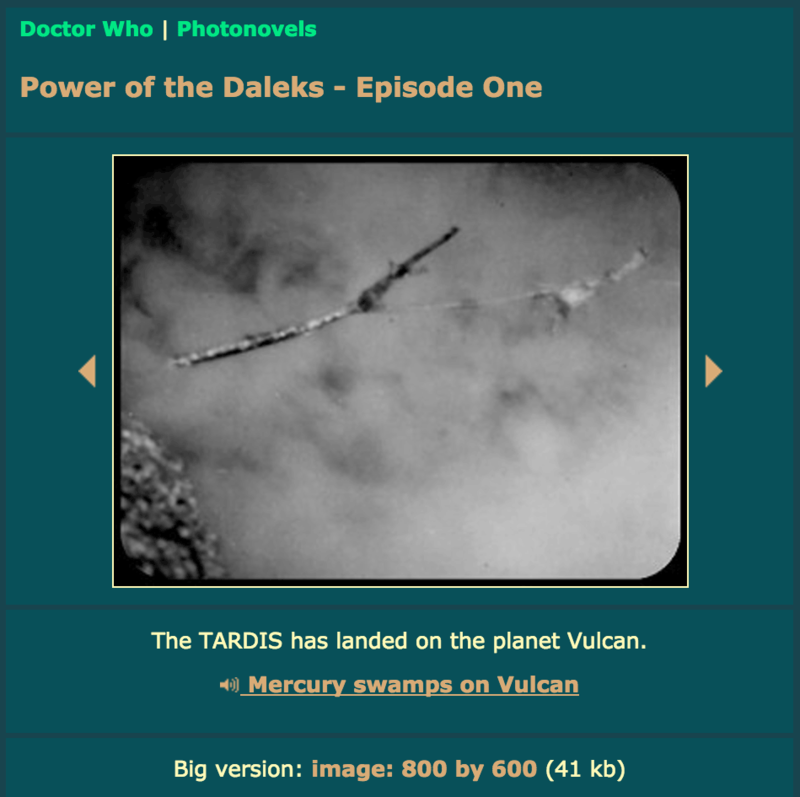 The left-hand navigation no longer works, every link taking you back to the modern Doctor Who homepage, not any of the hubs for the actual content that still survives. And worst of all, the reconstruction work they’d done is all gone. Interspersed throughout the photonovels were media files containing surviving fragments of footage, or the sound effects that went with a particular scene. All of that was delivered through RealMedia. And all of it is now utterly, utterly broken. I guess in a way we should just be grateful that the BBC is even still hosting flattened versions of the Doctor Who website from the early 2000s. And that the 404 page when you try to hear what the mercury swamp sounded like is cool. 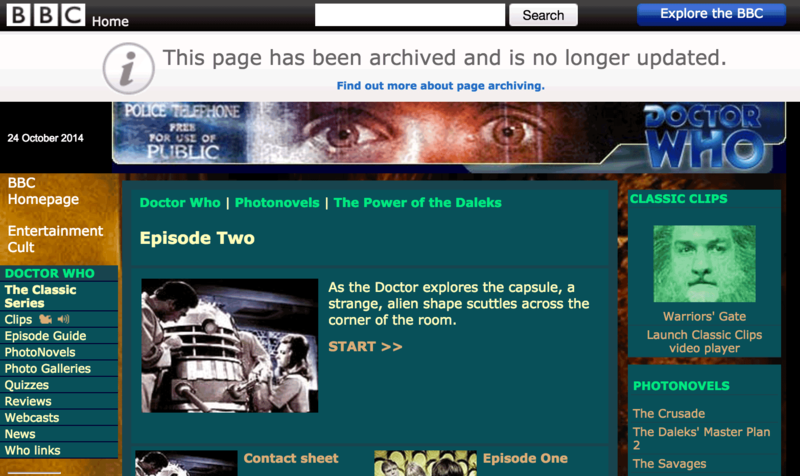 But boy is it galling to see the BBC fail to preserve “Power of the Daleks” for a second time.